Every August classic car fans from around the world converge on Pebble Beach in California for a very special beauty contest. This gathering of magnificent classic cars is the perfect place to premiere the exclusive Vision Mercedes-Maybach 6, a sensational luxury-class coupe. The 2+2 seater is a homage to the glorious age of the aero coupes and consciously carries this tradition forward into the future. The coupe reinterprets classic, emotional design principles in an extreme way, following the Mercedes-Benz design philosophy of sensual purity. 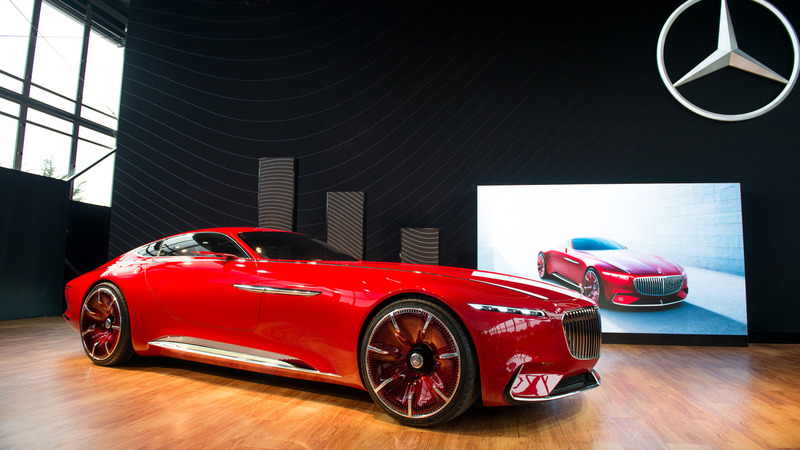 The Vision Mercedes-Maybach 6 is designed as an electric car. Whit the help of its four compact permanent magnet synchronous electric motors, it features all-wheel drive. The maximum output of the drive system is 550 kW (750 PS). The shallow underfloor battery has a usable capacity of approx. 80 kWh. This not only allows performance characteristics typical of a sports car (acceleration from 0‑100 km/h in less then 4 seconds, which hit the top speed at 250 km/h) but also a range of over 500 kilometres according to the NEDC (over 200 miles according to EPA). 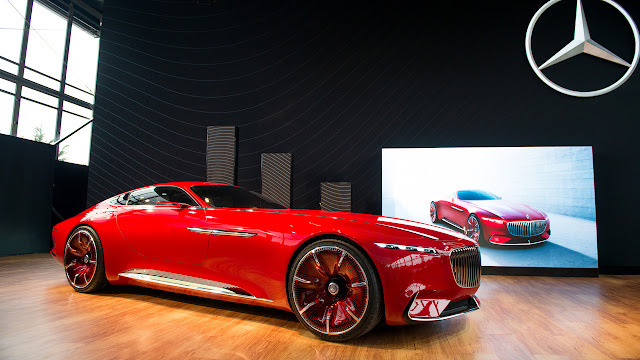 With its impressive dimensions, the Vision Mercedes-Maybach 6 (length/width/height: 5700/2100/1328 millimetres) is the first luxury coupe in the series of visionary design show cars from Mercedes-Benz. Is this Classic, aesthetic or Spaceship looks ? In first meeting with this Red Beauty , we thought it is new car for the Hollywood movie " The league of Extraordinary Gentlemen" . Do you remember that huge car? 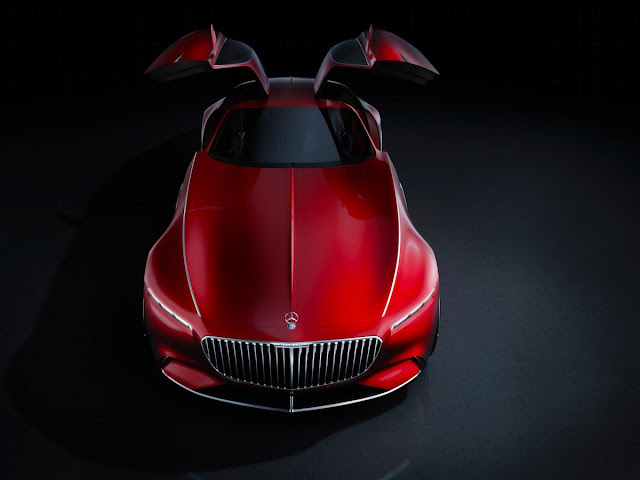 But With its sensual, emotional design (“hot”) and intelligent details (“cool”), the Vision Mercedes-Maybach 6 represents the ultimate in luxury. The classic artistic proportions of the show car – the extremely long bonnet , i love it, the low roof line and the rearward positioning of the greenhouse – recall the aero coupes of days gone by. But this is not 1965 Hollywood retro design – this is a reinterpretation of classic, aesthetic principles. This large coupe has set to made its debut at Monterey Car Week. 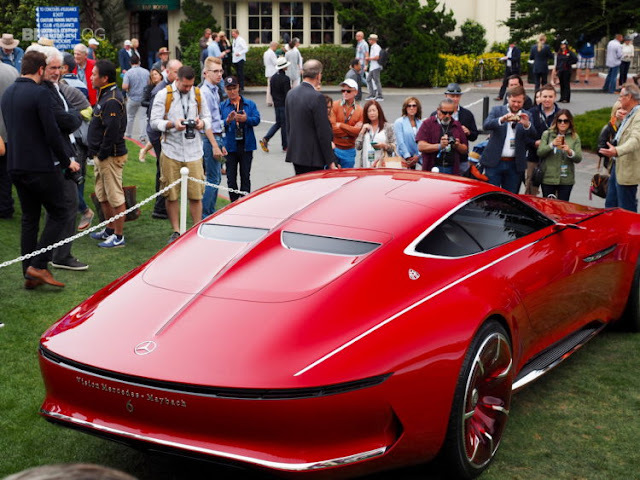 The final event was held on 21 August at the Pebble Beach Concours d’Elegance. Clearly defined contours and organically formed wings stand in contrast to the sharply drawn, extended feature line on each side which defines the upper vehicle body from the radiator grille across the entire length of the vehicle to the rear. There is also a striking contrast between the Maybach red paintwork and the chrome strips which sit above the wheel arches and in the centre of the bonnet and boot lid. A reinterpretation of the Mercedes-Maybach radiator grille with its fine, vertical struts accentuates the front end. The extended, round “boat tail” format of the Vision Mercedes-Maybach 6’s rear recalls a luxury yacht. Its Red beautiful wheels and Gull-wing Doors will definitely attracts you. Don't try to judge its interior form its external looks, when you enter in the cockpit you will find , a kind of NASA's Mars mission spaceship .The front windscreen serves as a transparent display: driving-related data and geographical information is shown across its full width, augmenting the outside world with additional information. This information can be controlled and adjusted by the occupants using gestures. 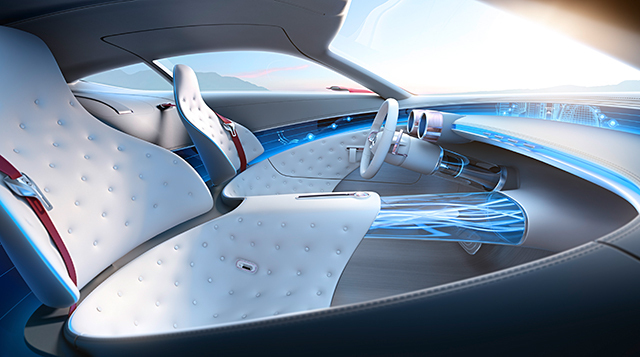 The dashboard wing curves across the door trim into the seat landscape, creating a 360° lounge.